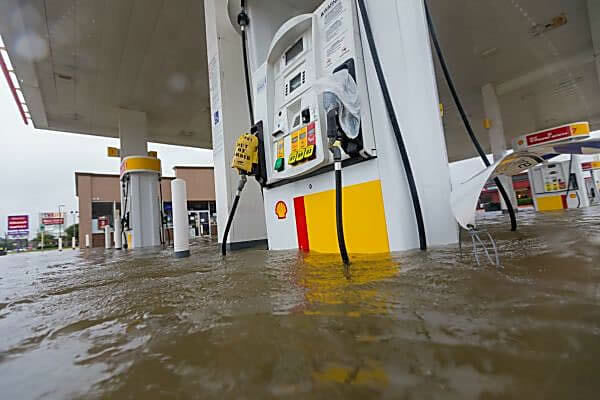 A fueling site that has equipment that has been partially or entirely submerged should inspect and evaluate their equipment. –Hoses (whip and curb) should be cleaned and inspected. Replace the hose if there is corrosion on the fittings. Replace the hose if there are cracks, delamination, kinks, tears or punctures. – Breakaways and combos should be cleaned and inspected. Replace the breakaway if there is corrosion around where the male is inserted into the sleeve. Mag-Breaks® should be separated and inspected for any corrosion or debris and then reconnected. – Swivels should be cleaned and inspected. Replace the swivel if there is corrosion in or around any of the joints. Replace if the swivel doesn’t rotate freely or the rotation feels gritty. – Nozzles should be replaced if they have been partially or completely submerged. Any that have not been underwater should be cleaned and inspected. If there is debris or damage inside the spout or vent tube opening, the nozzle should be replaced. -When checking the equipment by flowing fuel, if it is apparent there has been water inside the hose or nozzle, replace all the hanging hardware. For any equipment that wasn’t replaced, it is recommended to re-evaluate the equipment every month to inspect for any flood related damage or corrosion that may have grown over time. If you have any further questions or would like to order replacement hanging hardware, call us at 1.800.238.1225 . You can find many of Husky’s great products along with thousands of others ready to purchase through our online store today! 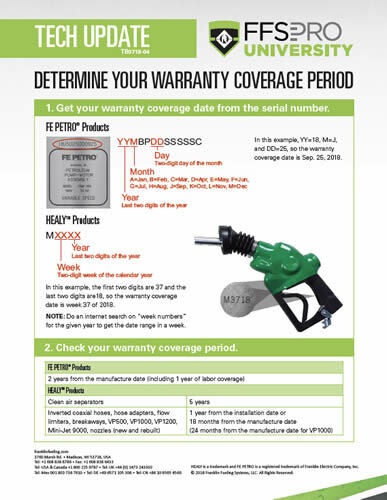 This is just a quick update and reminder from our friends at Franklin Fueling Systems to make you aware they have released a handy document to help you interpret your Healy™ and FE Petro® product serial numbers to determine your warranty coverage period. Click here to download the FFS technical bulletin. The guide will help you interpret the coverage date within the serial number, outline the coverage period for your FE Petro and Healy products and how to request an RGA from Franklin. But if you are not feeling that ambitious, by all means, feel free to call us here at the Kennedy Company at 1.800.451.4021 to help determine your warranty coverage and obtain an RGA to replace yourdefective product if needed. We also invite you to check out Franklin Fueling’s Customer Drawings Portal to access every drawing at your fingertips. Search, view and download all customer drawings on one page! Click on the graphic above or visit the drawing portal by clicking here.